In 1946 Southern Vectis added the first three post war examples of the Bristol L5G to its pre war and wartime fleet of the model. EDL 14 -16 arrived with Eastern Coach Works B35R bodywork, but, in 1961, all three were rebuilt with ECW B31F bodies for (what was then called) OMO operation. These later bodies incorporated the unprepossessing style of ECW radiator grille that must surely have been inspired by the dental profession. 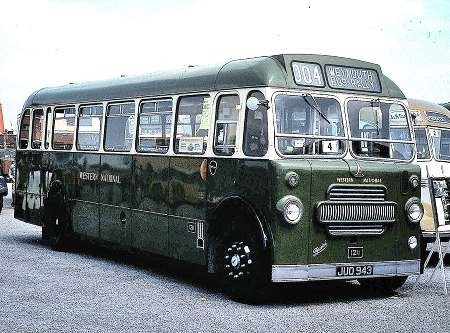 Having gained some 23 years of faithful service from these buses, Southern Vectis sold all three in 1969, whereupon EDL 16 passed through a dealer in 1970 to Nadder Valley Coaches of Tisbury, Wiltshire, with whom it is seen above in Shaftesbury in 1971. Nadder Valley ceased to operate EDL 16 early in 1972, and its subsequent fate is unknown. I am sure that a contemporary BI has these as rebodied by ECW rather than rebuilt. 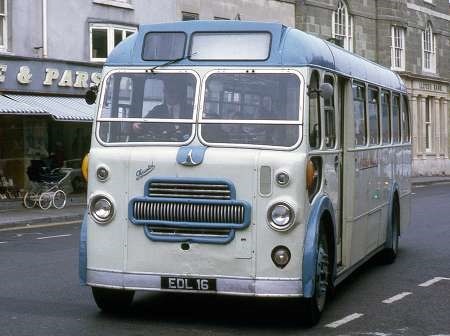 Compared with a standard ECW L body the windows appear somewhat larger and the roof profile looks a little different although it could be an optical illusion. The treatment has an air of the SC4LK about it. I guess it is difficult to decide where rebuild ends and rebodied begins. Is there a percentage of the original below which it becomes a rebody? Yes, Malcolm, rebodied is the better word. Here is another shot of this bus on its arrival in Shaftesbury. 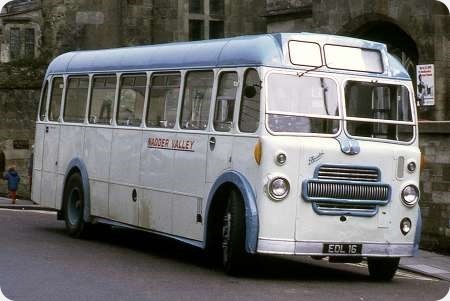 I recall many years ago coming across a bus with this style of body in Morpeth Market Place. When I first saw it, I assumed that it was a Bristol SC4LK, a type that I had not come across as United did not operate any. However on closer investigation, I found that it was not a Bristol, but a Leyland. As far as I was able to find out, it was a Leyland PS1 originally with Cumberland Motor Services, who’d had it rebodied, although what it was doing in Morpeth I have no idea. I assume that it had been purchased by a local operator. Perhaps some-one has more details on this vehicle. Bus Lists on the Web has this as rebodied FB35F. Malcolm, Messrs Doggett & Townsin’s book ‘ECW 1946-1965’ states that the Southern Vectis trio were rebodied by ECW in 1961/62. It is stated in the book that: "The demand for a smaller and lighter type of single-decker was being met by the Bristol SC type, as described in the previous chapter, but the body design developed for it was also used for rebodying Bristol L-type and other chassis in a way which made them suitable for one-person operation. The forward-entrance layout and full-fronted cab suited this requirement, and the body design could be lengthened if need be". Southern National, Western National, Thames Valley and Hants & Dorset are mentioned as having Bristol L coaches rebodied thus, these being lengthened in the process to LL dimensions, whereas the three Southern Vectis L-types were not lengthened. Cumberland also had a Leyland Tiger PS1/Associated Coachbuilders coach similarly rebodied by ECW. Looking at one or two photos, the rebodied heavyweights appeared to have strongly resembled the SC in many respects, including the side windows, roof contours and the later more ornate ‘mouth organ’ grille. The SC’s familiar one-piece rear window was also utilised. One subtle difference I’ve noticed between the SC and L-type rebodies relates to the windscreen. The lower edge of SC windscreens is horizontal, whereas that on the L-type has a slight downward slope towards the outer corner of each screen. The other difference relates to the front wheels – the SC having eight wheel studs/nuts per hub compared with the L-type’s ten. So Malcolm, your comment that "The treatment has an air of the SC4LK about it" certainly rings true! Cumberland in 1949/1950 got a batch of Leyland/ACB coaches registered HRM 79 and JAO 831-840 Between May 1958 and April 1960 all the JAO’s and the HRM were re-bodied, ten by Cumberland as B34F and one JAO (837) by ECW as FB35F. All were fitted for one-man operation. The ECW bodied JAO837 was unique for Cumberland but it was like the ECW bodied Bristol SC4LK coaches. Meanwhile, the Cumberland half cab ones were very good looking buses. 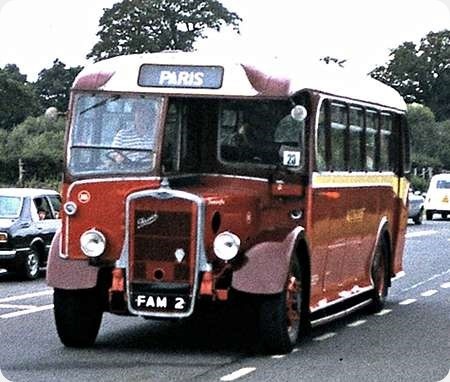 FAM 2 is a Bristol L6B with Beadle C32R body (with door) and it dates from 1949. We see it passing Beaulieu on 20 August 1978, while taking part in a vintage vehicle run through the New Forest. It included cars and fire appliances. It was owned at the time by the family who owned the village garage in Fawley – home of the Esso refinery and the power station.